How Would You Rate The Players v Wigan? Rotherham United might not have had the best first half we’ve seen them in this season at the DW this afternoon but we did play better in the second half. I asked on the coach on the way home and most of the people around me said if they were to pick a Man of the Match it would be goalkeeper Marek Rodak. 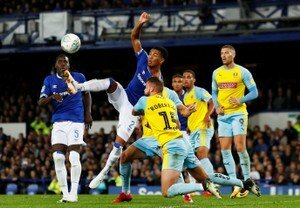 Rodak certainly kept us in the game in the second half – it was difficult to see from our position in the ground what had gone on for the goal Wigan scored and who was at fault and I haven’t seen it back yet but initially our ‘keeper kept the ball out before it fell to the Wigan sub who tapped it in. Did anyone else stand out today? I actually thought Kyle Vassell worried Wigan when he came off the bench and Ryan Williams did OK coming forward in the second half. And again I felt sorry for Michael Smith up front on his own and being tugged about especially by Cedric Kipre who should have been stopped early on in the game with a yellow card, in my opinion. So who else played well for you? How will YOU rate the players? Get going! (And we’ve still got the ‘rate the players’ poll for the Everton game up and running).